Metabolic syndrome, originally described in 1988 as “syndrome X” by Reaven et al. (1), has evolved in our collective thinking from a vague association of common chronic disease states to a formally defined cluster of clinical traits with adverse impact on cardiovascular risk (2). The cause is incompletely understood but represents a complex interaction among genetic, environmental, and metabolic factors, clearly including diet (3,4⇓) and level of physical activity (4,5⇓). These abnormalities are mediated by—and interconnected by—complex pathways that affect energy homeostasis at cellular, organ, and whole-body levels. This review focuses on obesity-initiated metabolic syndrome, first to provide a pathogenetic overview of extrarenal metabolic derangements; second to consider predisposing conditions shaped by genetic or environmental factors, including growth constraints in utero; and finally to consider the impact of metabolic syndrome on the kidney in its prediabetic phase. The pathogenesis of hypertension in the context of metabolic syndrome is considered separately in this series. Similarly, central nervous system pathways that contribute to disordered energy homeostasis is addressed in detail by others. The mechanisms of irreversible renal injury from hypertension and overt diabetes are well documented and are beyond the scope of this review; nonetheless, they loom large in the long-term renal future of the patient with metabolic syndrome. The current worldwide epidemic of obesity-initiated metabolic syndrome, with its potential for renal damage, mandates our commitment to early renal protection in the obese and to vigorous prevention of obesity in both pediatric and adult populations. The Adult Treatment Panel III (ATPIII) of the National Cholesterol Education Program (NCEP) (2) defines metabolic syndrome clinically as any three of the following five traits (Table 1): abdominal obesity, impaired fasting glucose (reflecting insulin resistance), hypertension, hypertriglyceridemia, and low HDL cholesterol. In addition, the NCEP ATPIII recognizes prothrombotic and proinflammatory states as characteristic of metabolic syndrome (2). Importantly, as subsequent paragraphs detail, these simple clinical criteria for diagnosis belie the emerging complexity of the underlying metabolic derangements (6). Thus, insulin resistance is viewed as the essential common denominator of metabolic syndrome, regardless of cause. Abdominal obesity, now identified solely by waist circumference criteria (Table 1), is the single most common cause of insulin resistance, and key mechanisms that mediate this pathway are becoming clear (6). Hypertension [defined in this high-risk context as ≥130/85 (2)] and the typical pattern of atherogenic dyslipidemia—hypertriglyceridemia, low HDL cholesterol, and increase in small dense LDL particles (2)—are also likely downstream consequences of insulin resistance with identifiable contributions from specific organs. Clinical criteria also do not emphasize the role of disordered skeletal muscle metabolism in this syndrome or highlight for the clinician the therapeutic power of regular exercise to offset insulin resistance. Finally, concepts now evolving from research advances suggest that the current clinical definition identifies individuals at a relatively advanced stage, well beyond onset of irreversible organ/tissue injury. Consequently, one immediate research challenge is to define, in the temporal evolution of metabolic syndrome, where interventions can both reverse metabolic derangements and prevent the tissue damage that conveys long-term risk. On the basis of the Third National Health and Nutrition Examination Survey (NHANES III; 1988 to 1994), the prevalence of metabolic syndrome in the U.S. population ≥20 yr of age is 23.7% (7), rising to >40% in those ≥60 yr of age and in those from specific geographic regions (e.g., south Texas) (8). This compares with a 30.5% prevalence of obesity (body mass index [BMI] ≥30) and a 64.5% prevalence of overweight (BMI ≥25) in the NHANES III U.S. population sample, reflecting marked increases of 7 to 10%, respectively, in the previous decade (9). Among non-U.S. populations, prevalence ranges from 49.4% of 1625 hypertensive individuals in Spain (10), 19.8% in Greece (11), and 17.8% in older Italians (12). The last cohort exhibited a stepwise increase in insulin resistance severity (by Homeostasis Model Assessment) with increasing numbers of metabolic syndrome features (12). Importantly, overt metabolic syndrome is not limited to adults (13). Cruz et al. (14) examined 126 overweight Hispanic children who were aged 8 to 13 and had a family history of type 2 diabetes; 62% exhibited abdominal obesity, and 30% met criteria for metabolic syndrome. As in adults, obesity in the pediatric population is increasing, with Hispanic and non-Hispanic black adolescents at greatest risk (15). The 2002 NCEP ATPIII panel rated metabolic syndrome equivalent to cigarette smoking in magnitude of risk for premature coronary heart disease (2). In epidemiologic studies, metabolic syndrome increases risk of developing overt diabetes (16), cardiovascular disease (17,18⇓), and cardiovascular mortality (17). In a prospective Finnish cohort, both NCEP ATPIII and World Health Organization criteria for defining metabolic syndrome predicted a five- to ninefold increase in risk of new diabetes over 4 yr (16). Lakka et al. (17), in a cohort of 1209 disease-free Finnish men who were aged 42 to 60 yr and followed for >11 yr, found that the presence of metabolic syndrome conferred a three- to fourfold increased risk for death from coronary heart disease. Using NHANES III data, Ninomiya et al. (7) described an approximately twofold increase in myocardial infarction and stroke risk in the presence of metabolic syndrome. The NCEP panel identifies the root causes of metabolic syndrome as overweight/obesity, physical inactivity, and genetic factors (2). Unraveling underlying mechanisms has been complicated by the unique multiorgan complexity of this trait cluster. Fundamentally, the metabolic syndrome reflects disordered energy homeostasis. Just as evolution prepared us well for surviving hypotension but poorly for combating hypertension, it has apparently equipped us for surviving the fast but not the feast. Unger (19,20⇓) described metabolic syndrome as “a failure of the system of intracellular lipid homeostasis which prevents lipotoxicity in organs of overnourished individuals,” a system that normally acts “by confining the lipid overload to cells specifically designed to store large quantities of surplus calories, the white adipocytes.” Central to the breakdown of this system are (1) exogenous fuel overload, (2) ectopic accumulation of lipid in nonadipose cells (21), and (3) insulin resistance (3,16⇓). To summarize concepts to be detailed below, the evolution of metabolic syndrome seems to proceed not as a linear sequence of events but along a matrix of interconnected pathways that mediate interactions among multiple organs and also link these organs as a functional unit to regulate total-body energy homeostasis (Figure 1). Each organ/cell type is typically both a target and an effector within this matrix. Furthermore, disturbance within this matrix of pathways can be initiated by stimuli acting at any one of multiple sites in the matrix (e.g., in adipocytes, in hepatocytes, in skeletal myocytes), each independently capable of disturbing whole-body fuel homeostasis. However, initiation of metabolic syndrome by obesity, in keeping with the now-recognized role of adipose tissue as an endocrine organ, is characterized by powerful systemic stimuli that together impair energy homeostasis in multiple organs simultaneously, leaving no room for protective compensation. This multiplicity of pathways and targets likely explains the efficacy of obesity as the major generator of metabolic syndrome. Figure 1. Pathogenesis of obesity-initiated metabolic syndrome. Increased abdominal fat mass yields high circulating free fatty acids (FFA), which drives increased cellular FFA uptake. Reduced release of adiponectin from expanding abdominal white adipose tissue (WAT) reduces mitochondrial FA uptake/oxidation in multiple tissues. Despite increased release of leptin from WAT, which normally also enhances FA oxidation, tissue resistance to leptin further promotes cytosolic FA build-up. As a result, excess intracellular FA and its metabolites (fatty acyl CoA, diacylglyceride) accumulate, causing insulin resistance (see pathway, Figure 2). Organ-specific consequences include increased hepatic gluconeogenesis and reduced skeletal muscle glucose uptake; the latter raises plasma glucose content and stimulates pancreatic insulin release, and hyperinsulinemia ensues. The newly available glucose plus high insulin now comes back full circle to stimulate further WAT lipogenesis. Increasing fat cell size induces release of chemotactic molecules (e.g., monocyte chemoattractant protein-1) with macrophage infiltration plus TNF-α and IL-6 generation. These cytokines generate an inflammatory reaction and enhance adipocyte insulin resistance in WAT. Figure 2. Intracellular pathways of insulin resistance. Accumulation of FA and its metabolites (fatty acyl CoA and diacylglycerol) induce protein kinase C isoforms, leading to serine/threonine phosphorylation of insulin receptor substrate-1 (IRS-1) on serine 302. This renders the IRS-1 resistant to tyrosine phosphorylation by the activated insulin receptor. As a result, downstream effects of insulin receptor activation—Akt activation and translocation of the glucose transporter Glut 4 to the plasma membrane—is reduced. Glucose uptake is thereby diminished, secondarily decreasing both glucose-derived glycogen synthesis and glucose-dependent lipogenesis. Activation of the JNK pathway by elevated cytoplasmic FA may provide an additional pathway for induction of insulin resistance. Adapted from reference 52. Obesity-initiated metabolic syndrome is consistently associated with specific metabolic abnormalities: high circulating free fatty acids (FFA) (22); increased intracellular lipid content of not only white adipose tissue (WAT) but also hepatocytes, skeletal myocytes, pancreatic β cells, cardiomyocytes, gastrointestinal enterocytes, and vascular endothelial cells (23,24⇓); insulin resistance in (at least) the same list of tissues; and reduced functional activity of two insulin-sensitizing adipokines that promote tissue fuel oxidation, adiponectin (25–27⇓⇓), and leptin (27). As abdominal fat expands, adiponectin is progressively reduced (25) while leptin levels are progressively elevated (28), the latter reflecting tissue leptin resistance (20,29⇓). Although not yet included in formal clinical definitions, additional features are increasingly considered integral to obesity-initiated metabolic syndrome: macrocytic infiltration of WAT (30,31⇓), increase in local and circulating inflammatory markers [C-reactive protein (32), TNF-α (33), plasminogen activator inhibitor-1 (34,35⇓), and IL-6 (36)] and hyperhomocysteinemia (37). How do we integrate these diverse elements into a coherent process that permits rational clinical interventions? New data suggest that excess visceral fat mass alone is sufficient to generate all elements of the metabolic syndrome. Most studies support the view that the metabolic syndrome that now confronts U.S. physicians in epidemic proportions is largely initiated by abdominal obesity. The four most crucial elements that link abdominal obesity to other features of the metabolic syndrome seem to be elevated FFA, reduction in circulating insulin-sensitizing adiponectin, peripheral-tissue resistance to the insulin-sensitizing actions of leptin, and enhanced macrophage infiltration in fat tissue with release of proinflammatory cytokines (Figure 1). Abdominal fat is unique in its metabolic features as compared with peripheral fat depots, exhibiting larger adipocytes that contain more triglyceride (TG) and exhibit greater insulin resistance than smaller adipocytes. Adipocyte resistance to the lipogenic effect of insulin yields higher basal rates of lipolysis with increased release of FFA into the portal venous system. This direct access to the liver (see below) may also contribute to the unique impact of visceral fat on energy homeostasis. Abdominal fat may also secrete less leptin than subcutaneous fat. Thus Cnop et al. (28), comparing lean-insulin resistant, lean insulin-sensitive, and obese insulin-resistant adults, found that leptin levels correlated with increasing subcutaneous—but not visceral—fat mass, proposing yet another metabolic distinction between these two compartments. Abdominal fat mass expansion is also coupled with reciprocally reduced release of adiponectin, a multifunctional collagen-like molecule with potent capacity to stimulate fuel oxidation in peripheral tissues (25). Abdominal fat additionally expresses higher levels of renin-angiotensin system components: increased angiotensinogen and increased angiotensin II (Ang II) AT1 receptors (38). Finally, epidemiologic studies confirm the unique significance of abdominal fat mass in predicting microalbuminuria, diabetes, and overall cardiovascular risk (39). It was this compelling evidence for a unique role of central or visceral obesity—in contradistinction to subcutaneous obesity—that prompted the NCEP ATPIII decision to specify abdominal obesity in the clinical definition of metabolic syndrome. These phenomena originating in abdominal adipose tissue generate the clinical picture that we recognize as metabolic syndrome. The roles of FFA excess and adiponectin deficiency are reviewed below in the context of their actions in individual organs; the role of leptin is addressed subsequently to compare and integrate prevailing views of how insulin resistance evolves. Under conditions of normal energy homeostasis, the liver serves as a short-term energy reservoir, taking up absorbed dietary glucose and FFA, synthesizing/storing glycogen, synthesizing/storing TG, and packaging TG into VLDL. During fasting, the liver must sustain a continuous supply of plasma glucose, acutely by glycogenolysis and later in the fasting period by gluconeogenesis. Secreted VLDL provides ongoing TG and ultimately FA fuel to skeletal muscle, heart, and other peripheral tissues via lipoprotein lipase activity in the vascular space. Intracellular FFA content is a function of substrate delivery from the plasma and FFA utilization (efflux into mitochondria for oxidation or cytosolic synthesis of intracellular lipids). With abdominal obesity, the increased FFA released into the portal vein from excess visceral fat lipolysis have direct access to the liver. Because cellular FA uptake is substrate dependent, increased hepatocyte FFA uptake ensues (23). Elevated cytoplasmic FA content leads to hepatic insulin resistance. This process involves competition of FA and glucose for access to mitochondrial oxidative metabolism. The molecular mechanism was recently described by Shulman et al. (40,41⇓) (Figure 2), wherein elevated intracellular fatty acyl CoA activates protein kinase Cθ (PKCθ), causing phosphorylation of serine-302 of insulin receptor substrate-1 (IRS-1). This renders IRS-1 unavailable for tyrosine phosphorylation by the activated insulin receptor and reduces all downstream actions of insulin. As a result, the fasting state is simulated and hepatocyte enzymatic machinery is shifted to favor enhanced hepatic gluconeogenesis at the expense of glycogen synthesis. The consequent increase in liver-derived glucose in plasma leads to hyperinsulinemia, a hallmark of metabolic syndrome in its earliest stage and a marker of insulin resistance. The capacity of the insulin-resistant liver to impair secondarily systemic energy homeostasis is illustrated by transgenic studies introducing an insulin-resistant form of the rate-limiting enzyme of liver gluconeogenesis: phosphoenolpyruvate carboxykinase (42). Creating isolated hepatic insulin resistance led to systemic hyperglycemia, hyperinsulinemia, and a moderate increase in fat mass (42). The last reflects WAT utilization of surplus circulating glucose for insulin-induced lipogenesis. In effect, this represents a redistribution of fuel away from the liver to adipose fat stores. These findings emphasize the potential for activating the abnormal metabolic matrix simply by inducing hepatic insulin resistance and also illustrate the dual role of the liver as target and effector in metabolic syndrome derangements. In dogs that were fed an isocaloric moderate-fat diet, striking visceral obesity was associated with marked reduction in the ability of insulin to suppress hepatic gluconeogenesis, even before any reduction in insulin-stimulated glucose uptake appeared; investigators concluded that hepatic insulin resistance plays a dominant role in the pathophysiologic cascade initiated by abdominal obesity (43). FFA overload also provides substrate for increased hepatic TG synthesis and for TG-rich VLDL assembly and secretion. Although details are beyond the scope of this review, the peripheral metabolism of these VLDL generate a small, dense form of highly atherogenic LDL [reviewed by Avramoglu et al. (44)] along with an increase in plasma TG. In addition, increased hepatic lipase activity in the insulin-resistant state reduces levels of protective HDL-2 cholesterol (45), which is essential to the transport of cholesterol from tissues back to the liver. Thus, hepatic insulin resistance, high plasma TG, and low plasma HDL are pathogenetically linked manifestations of altered lipid regulation in metabolic syndrome. In addition to the effects of elevated FFA load, the energy-related functions of the liver are profoundly affected by the reduced circulating levels of the adipokine adiponectin. The actions of this multifunctional protein are organ specific and uniformly insulin sensitizing. Adiponectin normally promotes insulin sensitivity in liver in part by enhancing FA oxidation (46); this reduces accumulation of cytoplasmic FA, thereby reducing intracellular FA levels and enhancing insulin action via IRS-1 availability to the insulin receptor. Second, like insulin, adiponectin normally suppresses hepatic gluconeogenic enzymes and induces glycogenetic enzymes. Increase in 5′-AMP-activated kinase mediates these effects of adiponectin (46,47⇓). Conversely, deficiency of adiponectin in states of abdominal obesity directly contributes to insulin resistance by further enhancing accumulation of intracellular FA and FA metabolites and by stimulating hepatic glucose output. The impact of insulin-sensitizing adipokines is apparent from transgenic mouse models that completely lack fat (and thus both adiponectin and leptin) (48). Animals are insulin resistant; the provision of physiologic levels of both adiponectin and leptin fully restores normal energy homeostasis, whereas either alone is only partially effective (48). These studies underscore the regulatory role of fat-derived adipokines and lend logic to the seeming paradox that either too little or too much adipose tissue can lead to insulin resistance (21). Increased circulating FFA also have an impact on skeletal muscle energy homeostasis. Skeletal muscle is normally a major site of glucose and FA uptake, accounting for the bulk of total-body glucose utilization and deriving 60% of resting energy from FA. As in the hepatocyte, increase in intramyocellular FA in skeletal muscle has been shown to impair insulin receptor signaling by PKC-dependent serine phosphorylation of IRS-1; this leads to reduced IRS-1 availability for tyrosine phosphorylation, reducing Glut 4 translocation to the myocyte plasma membrane with consequent reduction in glucose uptake (6). Secondarily, glucose-driven lipogenesis and glycogen synthesis in skeletal myocytes are also reduced. Accordingly, elevated circulating FFA contribute to insulin resistance in both liver and skeletal muscle. As in the hepatocyte, reduced adiponectin secretion secondary to increased visceral fat mass augments insulin resistance in skeletal muscle, also in part via reducing FA oxidation rate, further increasing intramyocellular FA content and impairing insulin action (48). Using magnetic resonance spectroscopy in insulin-resistant offspring of patients with type 2 diabetes, Petersen et al. (49) found evidence of a 30% reduction in mitochondrial oxidative phosphorylation together with impaired muscle FA oxidation and an 80% increase in intramyocellular lipid content. 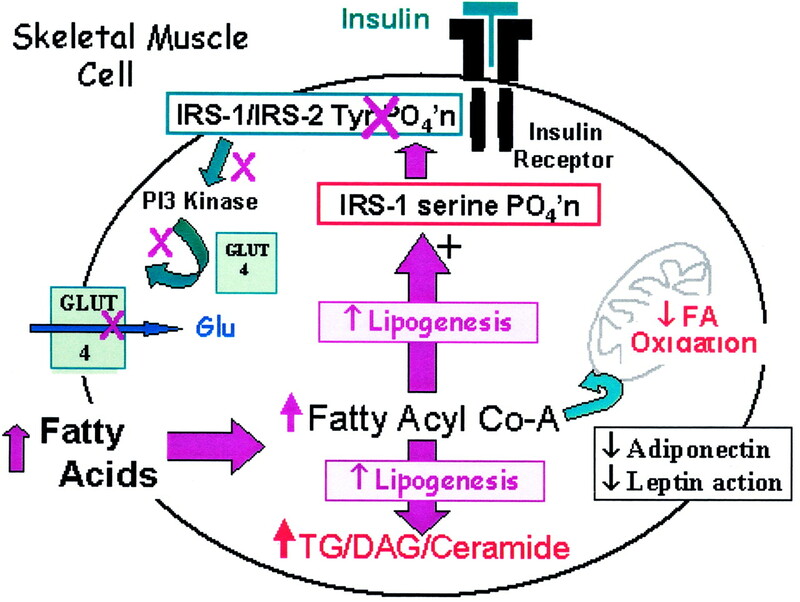 Overt diabetes has also been associated with impaired muscle oxidative capacity (50,51⇓). Finally, the insulin resistance of aging is associated with impaired mitochondrial FA oxidative capacity in skeletal muscle (52). Impaired energy production is a particularly important consequence of insulin resistance in skeletal muscle. Diabetic and prediabetic patients have impaired maximal exercise capacity, reduced maximal oxygen consumption, and slower oxygen uptake at initiation of low-level exercise, potentially contributing to the fatigue and reduced physical activity typical of obesity/insulin resistance (53). Exercise stimulates skeletal muscle oxidative enzymes and activates mitochondrial biogenesis (54). Inactivity would be predicted to reduce basal metabolic rate both by reducing muscle mass and by augmenting defective muscle energy production. The practical physical consequences of these skeletal muscle metabolic abnormalities have not yet been widely studied in metabolic syndrome but are likely to reinforce the vicious cycle of ongoing weight gain and sedentary lifestyle. The pancreas is the ultimate arbiter of insulin availability, determining the point at which overt diabetes will occur. Early in the course of metabolic syndrome, hepatic gluconeogenesis stimulates the pancreas to hypersecrete insulin, yielding normoglycemic hyperinsulinemia. Increased FFA uptake by pancreatic cells also increases glucose-induced insulin secretion and modifies expression of peroxisome proliferator–activated receptor-α (PPAR-α), glucokinase, and Glut 2 transporter (23). In the spontaneously obese captive rhesus monkey, hyperinsulinemia is sustained and progressively increases, eventually falling as overt hyperglycemia appears (55). Once hyperglycemia ensues, insulin-secreting β cells become targets of glucotoxicity: reduction in insulin-stimulated insulin secretion, late increase in mitochondrial free-radical production, and lipid overload–induced apoptosis (lipotoxicity; see also below) with progressive loss of β cell mass (56–58⇓⇓). Adverse effects of hyperinsulinemia per se on organ structure and function in the prehyperglycemic phase of metabolic syndrome are not well defined but are relevant to establishing optimum timing of intervention. It is worthy of emphasis that lifestyle interventions that reduce hyperglycemia can markedly decrease progression to overt diabetes (59). Available evidence indicates that the insulin-receptor signaling pathway mediating glucose uptake in vascular endothelium requires stimulation of endothelial nitric oxide (NO) synthase and NO production (60), a potent vasodilatory and antithrombotic stimulus. Comparable endothelial responses—enhanced NO production with vasodilation—are induced by adiponectin (61). These actions mediate a hemodynamic component of energy distribution, enhancing tissue blood flow to optimize nutrient delivery. When insulin resistance ensues, insulin-induced NO production is concomitantly impaired, representing one of several mechanisms linking abdominal obesity/insulin resistance and hypertension. Implications of endothelial dysfunction for hypertension in metabolic syndrome are addressed in detail by Dr. Sowers elsewhere in this issue. In addition to FFA excess and adiponectin deficiency, functional leptin deficiency in peripheral tissues is believed to play a significant role in the evolution of obesity-initiated insulin resistance. Leptin is secreted in proportion to body fat mass and, under normal circumstances, signals via central nervous system receptors to attenuate appetite and to enhance sympathetic outflow, the latter stimulating energy utilization and thermogenesis. Increase in fat-derived plasma leptin seen with abdominal obesity states is paradoxically coupled with poorly understood leptin resistance to central appetite-suppressing and to peripheral insulin-sensitizing effects of leptin (see below), thus a functional leptin deficiency. Central pathways of adipocytokines are addressed separately in this series. Unger and colleagues (62) proposed, on the basis of compelling experimental evidence, that peripheral-tissue leptin resistance is a crucial factor leading to insulin resistance in metabolic syndrome (19). They contended that leptin’s major role in normal energy homeostasis is not prevention of obesity, as originally conceived, but rather protection of nonadipocytes against the cytotoxicity of intracellular lipid overload during periods of nutrient excess (21,24⇓). Leptin potently activates cellular fuel consumption by stimulating FA oxidation, reducing lipogenesis, enhancing glucose entry and metabolism, and dramatically shrinking fat stores in adipose tissue (63) as well as in muscle and liver cells (24). Accumulation of cytoplasmic FA thus could reflect functional leptin deficiency acting via impaired mitochondrial oxidative capacity and concomitantly enhanced lipogenesis. The ensuing insulin resistance could be viewed as a compensatory cytoprotective response to prevent further accumulation of intracellular lipid, i.e., reduced glucose entry attenuates glucose-derived lipogenesis (21). The mechanisms of peripheral resistance to the fuel-burning actions of leptin are not yet known. In reality, excess FFA in the circulation, leptin resistance, and adiponectin deficiency are likely acting in concert to generate intracellular FA excess, although their precise sequence and relative importance remain to be determined. The biochemical pathways involved in these intracellular processes have been reviewed in detail by Unger (19,21⇓), Petersen and Shulman (64), and Shulman (6). The crucial participation of PPAR-γ, -α, and -δ in mediating tissue-specific actions of adiponectin and leptin—and their alterations in metabolic syndrome—are addressed separately in this series. Although excess abdominal fat serves to initiate dysfunctional energy homeostasis in multiple other organs, it eventually becomes also a target tissue. It is first a target of excess glucose in the vascular space. Increased glucose availability from liver-based gluconeogenesis and from muscle-based reduction in glucose uptake, together with pancreas-dependent hyperinsulinemia, promote lipogenesis in WAT (42) (Figure 1). This poses the disturbing possibility that abdominal obesity creates a self-perpetuating cycle. Excess cortisol activity is known to shift fat from peripheral (gluteal and subcutaneous) to central visceral depots and to mimic many aspects of metabolic syndrome. It thus is not surprising that glucocorticoid excess has been suspected in the cause of metabolic syndrome. Recently, increased activity (65) and a twofold increased expression of 11 β hydroxy steroid dehydrogenase 1 (11βHSD1) in adipose tissue of nondiabetic centrally obese women (66) were reported. This enzyme acts predominantly to convert inactive cortisone to the active cortisol form, thus generating glucocorticoid at a tissue level. Expression levels of 11βHSD1 were directly proportional to waist circumference and insulin resistance (66). Supporting the relevance of locally generated glucocorticoid in WAT, transgenic mice overexpressing 11βHSD1 in adipocytes faithfully reproduced the metabolic syndrome (67,68⇓), whereas deficient mice were metabolically resistant to high-fat feeding (69). Once again, a change confined to fat tissue induces systemic metabolic dysregulation. Expanding WAT also becomes the primary target of an inflammatory process. Recent studies in mice and human adipose tissue elegantly documented this process and implicated the role of macrophage infiltration and macrophage-derived inflammatory mediators in obesity and metabolic syndrome (30,31⇓). Weisberg et al. (31) demonstrated that increasing body mass and increasing fat-cell volume (i.e., fat content) each correlates linearly with bone marrow–derived macrophage infiltration in WAT and linearly with increased expression of macrophage-linked proinflammatory genes (Figure 3). Xu et al. (30) similarly found that upregulated genes in WAT of obese mouse models were primarily inflammatory genes linked to macrophage infiltration/activation; furthermore, in diet-induced obesity, this inflammatory process within WAT preceded insulin resistance. TNF-α and IL-6 have been shown to induce insulin resistance in vitro and to contribute to insulin resistance in mouse models of obesity (36,70⇓). This in situ inflammatory reaction within WAT therefore may induce/augment insulin resistance in the adipocytes per se, coming full circle in generation of multiorgan energy dysregulation. Figure 3. Macrocyte infiltration in WAT correlates linearly with body mass index and adipocyte size/fat content (31). 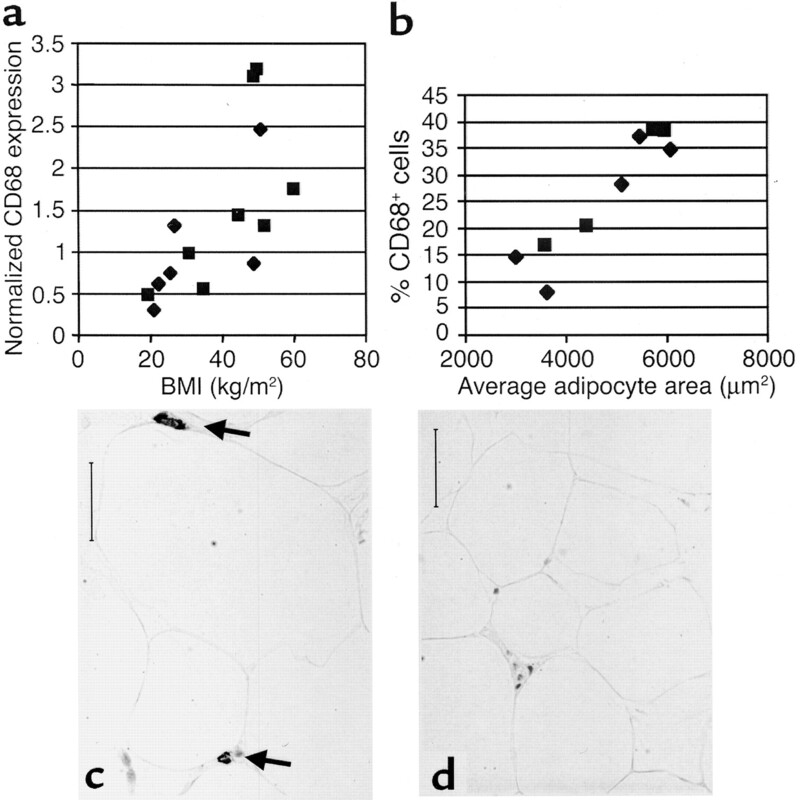 In human subcutaneous adipose tissues obtained from individuals with widely ranging body mass index (BMI), density of macrophage infiltration (measured by PCR quantification of CD68 mRNA, a specific macrophage marker) correlated linearly with BMI (a) and with average adipocyte cross-sectional area, an index of cell fat content (b). Squares and diamonds represent female and male subjects, respectively. (c and d) Representative photomicrographs of adipose tissue biopsies from obese (BMI 50.8 kg/m2; c) and lean (BMI 25.7 kg/m2; d) female subjects show the larger adipocyte area in obesity; arrows indicate F4/80+/bone marrow–derived macrophages. In studies in agouti (Ay) and obese (Lepob) mice and in humans, adipose tissue macrophages accounted for virtually all of adipose TNF-α, inducible nitric oxide synthase, and IL-6 expression (31), cytokines implicated in locally enhancing insulin resistance in WAT (Reproduced by permission from Weisberg SP, et al., J Clin Invest 112: 1796-1808, 2003). A number of factors influence risk for development of obesity-initiated metabolic syndrome. The increasing risk with age (4,71⇓) parallels the declining muscle mass and muscle oxidative capacity of aging (52). Hormonal changes with aging are also involved: the compensatory increase in T3-mediated thermogenesis induced by dietary fat in young rats is lost with aging (72). Lifestyle factors are similarly influential. In cohorts followed prospectively, regular physical activity and adherence to the Mediterranean diet significantly reduced risk (10). In the Framingham Offspring Cohort, diets with low glycemic index and high whole-grain attributes also decreased risk of developing metabolic syndrome (3). In addition to demographic and lifestyle modulators, recent interest has focused on two mechanisms of predisposition operative early in life: environmental “programming” by adverse events operative during early growth and development and genetic factors. Both can permanently modify postnatal organ functional capacity, permanently alter gene expression patterns and homeostatic setpoints, and also exhibit maternal transmission across generations (73,74⇓); as a result, the distinction between classic genetic inheritance and environmentally programmed effects can no longer rely solely on maternal phenotype. Figure 4. 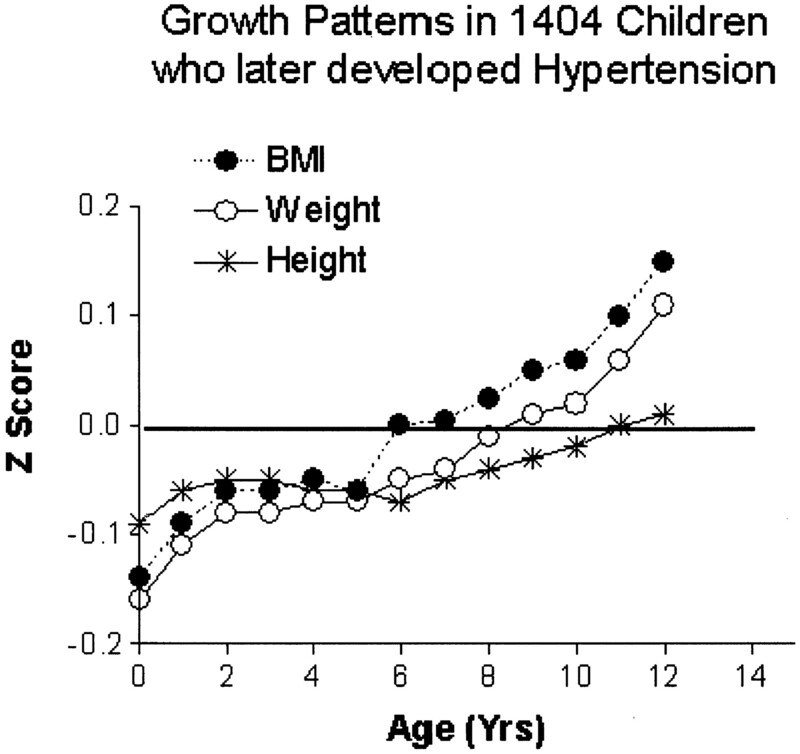 Pattern of infant and childhood growth in children who developed hypertension as adults. Growth rates are expressed as SD units (z scores) from the overall population average (set at zero). The 1404 of 8760 children who subsequently required antihypertensive medications as adults exhibited low birth weight and low birth BMI but exaggerated growth in weight and BMI between 5 and 12 yr of age. (Reproduced by permission from Barker DJ, et al., J Hypertens 20: 1951-1956, 2002). Another consequence of IUGR that predisposes to metabolic syndrome derives from unique developmental patterns of kidney, pancreas, and muscle in utero and their impact postnatally when structurally impaired at critical windows of development. Because each organ develops its respective functional units before birth, no additional units can form postnatally; maximal organ capacity thus is fixed at birth. Fetal undernutrition, depending on the developmental period of exposure, can lead to permanently reduced nephron number (78,92–95⇓⇓⇓⇓), permanently reduced pancreatic insulin-secreting β cells (96–98⇓⇓), and permanently reduced skeletal muscle fiber number (99,100⇓) and mitochondrial mass (101). Following the original hypothesis of Brenner and Chertow (92), Eriksson et al. (88) proposed for kidney—and others for pancreas (98)—that postnatal increase in body size beyond the birth weight percentile will impose metabolic and excretory demands that exceed organ capacities. These structurally based functional limits in key organs after IUGR would be expected to predispose to metabolic syndrome derangements at multiple sites simultaneously. In the face of abundant nutrients, the thrifty phenotype generates body size excess relative to organ capacity, deposits excess abdominal fat, and promotes abdominal obesity. Reduced pancreatic insulin secretory mass/capacity may hasten transition from hyperinsulinemia to overt diabetes. Lower muscle mass—which persists in adults who experienced IUGR (102)—could promote obesity via low basal metabolic rate and biologically based inactivity; the reduced skeletal muscle oxidative capacity and smaller mitochondria described in offspring with IUGR (101) could increase susceptibility to insulin resistance by favoring accumulation of intramyocellular FFA. From the renal perspective, Lackland et al. (103), comparing 1230 young ESRD subjects (70% caused by diabetes or hypertension) with 2460 matched control subjects in South Carolina, showed that low birth weight increased relative risk of early-onset ESRD. Our investigative group has pursued the hypothesis that exaggerated postnatal increase in body mass in the face of developmentally fixed nephron deficit would favor nephron adaptations of hypertrophy and hyperfiltration and increase in glomerular capillary pressure independent of obesity. That is, two independent consequences of IUGR—nephron deficit and thrifty-phenotype traits—interact to create imbalance between metabolic/excretory load and renal excretory capacity (Figure 5). To test this, we developed a microswine model of IUGR using maternal protein restriction during the window of nephrogenesis (in swine, the last one third or gestation plus first 2 wk postnatally). Offspring of low-protein sows, as compared with control offspring, exhibit a typical asymmetric pattern of growth restriction, have evidence of ∼30% reduction in nephron number, undergo 100% catch-up growth of body and organ sizes, and develop hypertension as young adults (6 mo) (104). In adults, renal weight and function are normal, but glomerular volume is increased, compatible with nephron hypertrophy and hyperfiltration. Woods et al. (94) reported similar findings in rat offspring of protein-restricted dams. We further proposed that this mismatch of excretory load to excretory capacity would induce compensatory nephron hyperfiltration via activation of the renin/Ang II system. In examining plasma components of renin/Ang II activity (105), we find no differences among low-protein versus normal-protein offspring for Ang II, plasma renin activity, or renin substrate concentration. In contrast, intrarenal Ang II levels are elevated in hypertensive adult low-protein offspring (106). This pattern of normal renin/Ang II status in plasma but activated status intrarenally is reminiscent of that observed in the diabetic kidney (107). In our 6-mo-old young-adult offspring of maternal protein restriction, glomerulomegaly and intrarenal Ang II excess are present in the absence of proteinuria (106). To distinguish between body mass excess and developmental programming of the renin/Ang II system as causes of these changes, we are currently examining whether prevention of catch-up growth by early postnatal caloric restriction modifies the renal adaptations, intrarenal Ang II, and hypertension. Figure 5. Proposed interaction between thrifty phenotype behaviors and fixed reduction in nephron number after intrauterine growth restriction. Fetal nutrient deprivation of any cause encompassing the last half of pregnancy typically impairs renal development and reduces nephron number. No new nephrons form after birth in humans. Nutrient deprivation also “programs” the fetus to utilize energy more efficiently, optimizing survival. Postnatally, the offspring exhibit hyperphagia on the basis of ad libitum food intake, increased efficiency in utilization of calories, and metabolic changes that reduce maximum capacity for energy consumption (reduced muscle mass, smaller mitochondria). If food is available in the environment, then hyperphagia drives caloric intake to yield rapid compensatory growth in weight more than height, crossing centiles to achieve typically normal BMI. Even in the absence of overt obesity, this now-normal body mass is relatively excessive for the fixed reduction in nephron number. In a microswine model, catch-up growth is associated with intrarenal angiotensin II excess and hypertension in young adults. This may be analogous to the increased risk of hypertension and proteinuria when obesity precedes unilateral nephrectomy. A third way in which IUGR may predispose to metabolic syndrome is fetal programming of gene expression that then persists to impair postnatal homeostatic functions. In the IUGR that results from severe maternal diabetes (in contrast to asymmetric macrosomia of milder maternal diabetes) (108), offspring exhibit reduced insulin secretion and low insulin receptor density in utero; this persists postnatally to generate insulin resistance and diabetes. Another important example of permanently altered gene expression has been described for the hypothalamic-pituitary-adrenal axis in rats (73). Maternal nutrient restriction has been associated with decrease in placental 11βOHSD2, which normally functions to inactivate maternal cortisol and keep fetal cortisol levels at less than one tenth of maternal levels. Fetal exposure to excess glucocorticoid permanently reduces adult hippocampal glucocorticoid receptor mRNA and increases adult corticosterone levels, suggesting a programmed reduction in postnatal sensitivity to cortisol feedback (109). Nutritional programming of postnatal homeostasis during periods of developmental plasticity is not confined to the fetal period. Srinivasan et al. (110) showed metabolic programming in neonatal rats in response to high-carbohydrate versus normal high-fat milk formula during postnatal days 4 to 24. Adaptations in the high-carbohydrate pups included life-long hyperinsulinemia, increased number and size of pancreatic islets, and adult-onset obesity (110). It is especially noteworthy that the high-carbohydrate-fed female rats transmit this phenotype to their progeny (110), much as diabetic mothers transmit risk of diabetes to offspring via the intrauterine environment (108). Similarly, female IUGR offspring deliver low birth weight babies (73), another example of a transgenerational effect that may confound interpretation of studies in which transmission of maternal traits has been viewed as “genetic.” This transgenerational reach of fetal programming (111,112⇓) is not currently understood but potentially relates to factors such as developmentally impaired vascularization of the uterus and/or nutritional effects on a female infant’s developing ova. In addition to age, demographic factors, and developmental programming, germline transmission of predisposing factors clearly contributes to risk of metabolic syndrome. Furthermore, the array of molecules and pathways involved in its generation—representing the entire molecular infrastructure of energy metabolism and its regulation—underscore the many candidate sites. A detailed listing is beyond the scope of this review. Instead, selective examples highlight major pathophysiologic pathways. Virtually all genetic mechanisms described involve interaction with environmental factors (e.g., nutrient abundance, sedentary lifestyle) to create metabolic disease. In the Quebec Family Study, Tremblay et al. (113) described in older children and adolescents a glucocorticoid receptor polymorphism that predicted twofold increase in visceral adiposity in girls >12 yr (a similar trend in boys was NS). Similarly, abdominal visceral fat was linked with an RFLP at the glucocorticoid receptor locus (114). As predicted from its antidiabetic efficacy, human adiponectin mutants have also been associated with diabetes: Waki et al. (115) reported two mutants that failed to form the high-molecular-weight multimers required for adiponectin secretion from the adipocyte. Genetic predisposition to insulin resistance has also received attention in relation to PPAR-γ2. A Gly483Ser missense mutation in the PPAR-γ coactivator 1 gene was associated with reduced lipid oxidation, larger abdominal adipocyte size, and higher plasma FFA concentration in Pima Indians and in Danish populations (116). Muller et al. (117) found that a functional variant in the PPAR-γ2 promoter with reduced transcriptional activity also predicted obesity and insulin resistance in the high-risk Pima Indian population. A Pro12Ala polymorphism in PPAR-γ2 also predicted insulin resistance in Pima Indians and in other populations (117). Of special note, the effects of the Pro12Ala polymorphism on lipid metabolism was apparent only in individuals with low birth weight (118), a fascinating example of an interaction between a classic genetic factor and early environmental programming. Evidence linking metabolic syndrome and renal disease has only recently emerged. In the Modification of Diet in Renal Disease study, a low HDL cholesterol independently predicted renal disease progression in 840 patients (119). In the Atherosclerosis Risk in Communities study of >12,000 subjects, Muntner et al. (120) observed that, in individuals who had baseline creatinine <2.0 and were followed for 2.9 yr, high TG increased (adjusted relative risk, 1.65) whereas high HDL cholesterol reduced (adjusted relative risk, 0.47) the probability of developing renal dysfunction. However, these observations did not directly address the impact of the full metabolic syndrome as currently defined. To that end, Chen et al. (121) recently compiled data from the NHANES III survey to examine the association between metabolic syndrome and the respective risks for chronic kidney disease (CKD) and microalbuminuria in U.S. adults. CKD was defined as GFR (Modification of Diet in Renal Disease formula) of <60 ml/m per 1.73 m2; microalbuminuria as protein:creatinine ratio of 30 to 300 mg/g, and clinical proteinuria as ratio >300 mg/g. 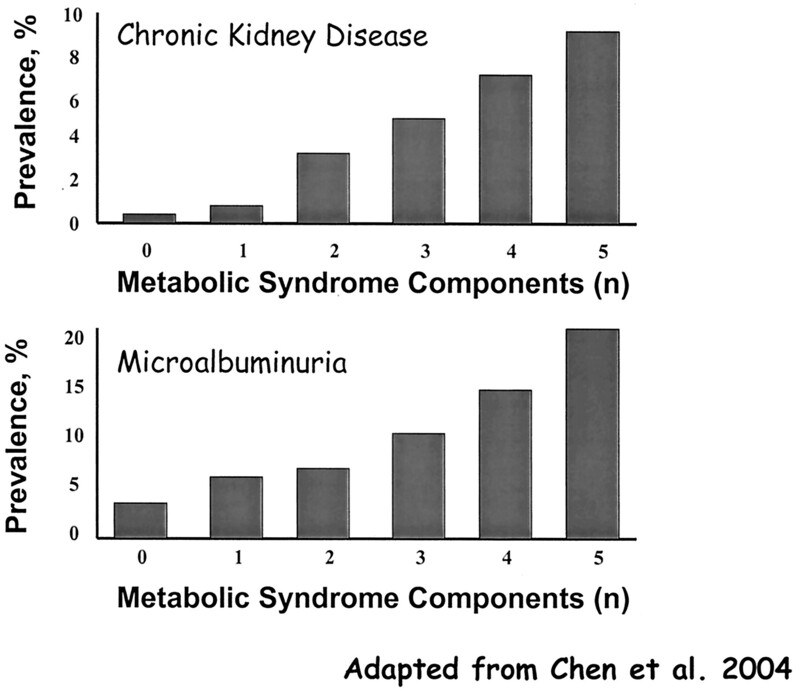 Not only was each element of the metabolic syndrome associated with increased prevalence of CKD and microalbuminuria, but also there was a graded relationship between the number of components present and the corresponding prevalence of CKD or microalbuminuria (P < 0.001 for each; Figure 6). Also using NHANES III data, Palaniappan et al. (122) found that the presence of metabolic syndrome was associated with an increased risk of microalbuminuria: odds ratio, 2.2 (1.4–3.3) in women and 4.1 (2.5–6.7) in men. Finally, Chen et al. (123) found that insulin resistance and hyperinsulinemia in individuals without diabetes strongly and positively predicted CKD and suggested that intervention to ameliorate insulin resistance could lower CKD risk. To date, however, there are no clinical trials addressing whether treating metabolic syndrome elements other than hypertension or diabetes will reduce risk of renal disease onset or progression; neither are there trials defining optimum target levels of treated components in these settings. Figure 6. Risk for chronic kidney disease (CKD; top) and microalbuminuria (bottom) according to number of metabolic syndrome elements. A significant graded relationship was apparent between number of components and corresponding prevalence of CKD or microalbuminuria (P < 0.001 for each comparison). (Adapted with permission from Chen J, et al., Ann Intern Med 140: 167–174, 2004). Renal changes occur early in the natural history of obesity-initiated metabolic syndrome. Studies in the captive rhesus monkey, in which spontaneous obesity evolves to fully developed metabolic syndrome (55), have shed light on the sequence and time course of disease progression. In these prospectively observed animals, progressive weight gain is followed in sequence by a sustained period of increasing hyperinsulinemia without hyperglycemia. This is followed by overt hyperglycemia and subsequently by declining insulin levels (55). Of note, the earliest evidence of structural change—glomerular hypertrophy—appears before the onset of hyperglycemia (124). In dogs on high-fat intake, renal structural changes appeared after only 7 to 9 wk and included glomerulomegaly with Bowman’s capsule expansion, glomerular cell proliferation, mesangial matrix expansion, and glomerular and tubular basement membrane thickening (125). Risk of death for the hyperinsulinemic (but not yet hyperglycemic) monkeys was 3.7-fold higher than that for diet-restricted (nonobese) controls (126). Placed on a human scale, whereby insulin resistance and hyperinsulinemia precede overt diabetes by 10 to 20 yr, these important observations suggest that structural changes long precede clinical disease manifestations. However, neither the full spectrum of early prehyperglycemia lesions and their time of onset nor their degree of reversibility are fully characterized. Although hypertensive and diabetic modes of injury are well described and beyond our scope, we can speculate on mechanisms of early renal damage in obesity-initiated metabolic syndrome. Several possibilities—acting singly or in combination—deserve consideration: (1) adverse effects of adaptations to increase body mass/excretory load, (2) adverse effects of adaptations to obesity-induced sodium retention (127), (3) direct or indirect effects of hyperinsulinemia/insulin resistance, and (4) renal lipotoxicity [see recent reviews by Hall et al. (127), Adelman (128), and Praga (129)]. Obesity is associated with an excess excretory load on the basis of increased body mass and the increased energy intake and tissue turnover required to maintain it. Fat-free body mass (130) is also increased in obesity; in keeping with functional overload, the organomegaly of obesity includes both the heart and the kidneys (131). Chagnac et al. (132) confirmed renal hyperperfusion and hyperfiltration in severe obesity, averaging 51 and 31% increases, respectively. The reduced renal resistance with increased filtration fraction was compatible with net afferent dilation and glomerular capillary hypertension (132), the classic recipe for eventual glomerulosclerotic damage. Furthermore, in keeping with glomerular hypertension, the first clinical evidence of renal disease in obesity is proteinuria (see below); weight loss can strikingly reduce proteinuria as a result of obesity per se or of other underlying causes (133,134⇓). In effect, obesity induces—even at normal nephron capacity—the single-nephron adaptations typical of the reduced nephron number accompanying CKD. Nephron overwork and risk of intraglomerular hypertension in obesity would be exaggerated if nephron number is already low, as would be predicted in offspring with IUGR (103) or after uninephrectomy (135). Increased glomerular risk as a result of transmission of systemic hypertension is also likely to apply. If chronic intrarenal Ang II excess proves typical of load adaptation, then Ang II could further enhance renal risk by proinflammatory mechanisms and by promoting proteinuria-related renal damage. Of interest in relation to load-induced nephron adaptation, Schwimmer et al. (136) reported focal segmental glomerulosclerosis (FSGS) and glomerulomegaly in three nonobese patients with markedly increased muscle mass, as evidenced by BMI of 30 to 32, body fat of only 13 to 17%, and nonnephrotic proteinuria ≥1 g/d. GFR of 113 to 208 suggested hyperfiltration; FSGS affected a minority of glomeruli, and foot process effacement was minimal. Because insulin resistance/hyperinsulinemia would not be expected in this setting, the changes—albeit in only three patients—conceptually support the view that excess excretory load—whether derived from lean or fat tissue—is an important factor in inducing glomerulomegaly and glomerulonephropathy. Hall et al. (127) proposed that, in response to the reduced Na excretion capacity acting at sites proximal to the macula densa in obesity (via Ang II and sympathetic activation), reduced NaCl delivery to the macula densa site induces afferent vasodilation and renin release to produce compensatory glomerular hyperfiltration, thereby restoring normal distal delivery. A similar scenario has been proposed by Thomson et al. (137) for hyperglycemia-induced increase in proximal tubular Na reabsorption in frank diabetes. As with hyperfiltration driven by excess excretory load, the ensuing intraglomerular hypertension and proteinuria represent the final common pathway leading to chronic glomerular and tubular injury. Recent evidence supports early development of pathophysiologic functional and structural changes. Thus, in the captive rhesus monkey with spontaneous obesity, glomerular hypertrophy appears in the prediabetic hyperinsulinemic phase despite no hyperglycemia, no hypertension, no renal dysfunction, and no increase in mesangial matrix deposition (124). However, these observations do not distinguish between effects of insulin resistance and hyperinsulinemia. Hall et al. (127) summarized evidence that high insulin per se has no adverse impact on BP in the normal or in the obese insulin-resistant dog. However, insulin—although a weak vasodilator—augments endothelial-dependent vasodilation; thus, hyperinsulinemia could contribute to preglomerular vasodilation and glomerular hypertension and require time to manifest damage. On the basis of in vitro observations, hyperinsulinemia could induce glomerular hypertrophy either directly (138) or by stimulating the IGF-1 receptor (138). IGF-1 actions (or actions of high insulin levels at the IGF-1 receptor) also include vasodilation (139) and may increase glomerular capillary permeability (140). Hyperinsulinemia could further interact with elevated intrarenal Ang II levels to augment Ang II contraction of glomerular mesangial cells (141). In addition, Abrass et al. (142) showed that high-dose insulin exerts direct pathologic effects on renal mesangial cells in culture, stimulating expression of inflammatory collagens typical of the diabetic phenotype. Importantly, the latter was not reversible on subsequent withdrawal of insulin (143,144⇓), suggesting permanently altered gene expression after exposure to high insulin. Again in the rhesus monkey, hyperinsulinemia—with or without hyperglycemia but not hyperglycemia with low insulin—was associated with an altered ratio of insulin receptor splice variants in liver and skeletal muscle (145). Finally, although hyperinsulinemia may achieve normal insulin action in insulin-resistant organs, it could lead to excess insulin action/glucose uptake and promote lipogenesis/lipotoxicity in sites with persistent insulin sensitivity. The evidence that hyperinsulinemia—in conjunction with increased glucose availability—actively promotes adiposity in WAT via just such a mechanism has already been discussed (Figure 1). These considerations underscore the importance of learning more about the structural and functional effects on specific tissues during the hyperinsulinemic, prehyperglycemic phase of metabolic syndrome. Whether injury at this early stage reflects insulin resistance and/or hyperinsulinemia, therapeutic intervention in metabolic syndrome could ultimately prove to be necessary at a much earlier stage than currently considered. A well-documented form of multiorgan injury associated with progression of metabolic syndrome is lipotoxicity (21,23,24⇓⇓). This cytotoxic process, marking advanced stages of intracellular lipid overload, involves intracellular shunting of excess FA toward synthesis of lipid products that are capable of inducing cell damage: e.g., diacylglycerol, TG, and ceramide (Figure 2). Diacylglyeride enhances PKC activities; ceramide is a major candidate mediator of apoptosis (19). Evidence indicates that lipotoxicity affects liver (hepatic steatosis), skeletal muscle, cardiomyocytes, pancreatic β cells, and potentially endothelial cells (24). This process not only impairs function in the individual cell but also reduces cell mass via apoptosis in multiple organs, each with important functional consequences. Lipotoxicity in proximal tubular cells—with its associated tubulointerstitial inflammation—is now a recognized consequence of heavy proteinuria as a result of accumulation of excess albumin-bound FFA (146,147⇓). However, no studies have systematically addressed whether FFA lipotoxicity afflicts renal cell types in obesity-initiated metabolic syndrome, particularly in the absence of (or independent of) proteinuria. The mesangial cell would seem at particular risk for exposure to high circulating FFA bound to albumin in the face of intraglomerular hypertension. In the presence of proteinuria—whether as a result of obesity per se or of other nephropathies—elevated plasma FFA in metabolic syndrome would be expected to enhance the number of FFA moieties bound to albumin and thus to enhance the FFA available for proximal uptake. Therapeutic lowering of FFA could potentially ameliorate proteinuria-associated proximal tubular lipotoxicity and tubulointerstitial nephritis. Oxidative stress is another potential mechanism of FFA toxicity: reactive oxygen scavengers block FFA-induced apoptosis in vitro (19). FFA both upregulate inducible NO synthase and generate reactive intermediates as byproducts of oxidative phosphorylation. High FFA per se during early metabolic syndrome, independent of intracellular TG accumulation, may be an important co-factor in epidemiologic linkage of abdominal obesity and microalbuminuria (148). Our growing understanding of the pathogenesis of metabolic syndrome provides the rationale for management strategies to achieving long-term renal and cardiovascular protection. As clearly demonstrated by primate studies (126,152,153⇓⇓), obesity-associated metabolic syndrome and its entire cascade of consequences can be resolved by weight loss and prevented by caloric restriction. Intensive programs of exercise and weight loss in individuals with metabolic syndrome also achieve dramatic improvement (59,154⇓). In the Diabetes Prevention Program Research study (59), the lifestyle intervention achieved a 58% reduction in the incidence of diabetes in individuals who already exhibited hyperglycemia. As difficult as these changes may be, there is no intervention more powerful. There is also no motivator more effective than a knowledgeable and concerned physician who is willing to convey personally the importance and the feasibility of lifestyle change. Growing understanding of the direct skeletal muscle benefits of regular exercise to offset insulin resistance, even in the absence of weight loss, makes this a mandatory recommendation well worthy of the education and counseling time invested. Pharmacologic interventions with well-established benefit include angiotensin-converting enzyme inhibitors and angiotensin receptor blockers, which increase insulin sensitivity (155) and ameliorate microalbuminuria in addition to their well-documented cardiovascular and renal protections (156); their use with BP >130/80 complies with the BP goal for metabolic syndrome (2). Statins are currently under study in prospective trials to assess their contribution to renal protection and are clearly indicated in the presence of hypercholesterolemia. Evidence that statins have anti-inflammatory benefit independent of lipid lowering suggests that clinical trials of their use in normocholesterolemic metabolic syndrome will be forthcoming. Metformin has been shown to be effective in preventing development of diabetes in prediabetic individuals (59), reducing incidence by 31%; however, it unfortunately is contraindicated with impaired renal function. There is at this time no long-term outcome data justifying use of the insulin-sensitizing thiazolidinediones in nonhyperglycemic metabolic syndrome. Moreover, the increased adiposity associated with these PPAR-γ agonists is intuitively concerning despite its putative nonabdominal localization. Although the PPAR-α and PPAR-βδ agonists seem superficially ideal, the risk that an increased metabolic rate—especially without concomitant calorie restriction—may reduce life span is not trivial, backed by a large body of literature, including primates (126). What can and should be aggressively addressed in metabolic syndrome at all stages is pharmacologic management of hypertriglyceridemia and low HDL cholesterol. Newer statins are more effective in reducing TG as well as LDL cholesterol, although cost will be the perennial drawback. Fenofibrate (a PPAR-α agonist) and niacin are effective tools for hypertriglyceridemia and can each (but not both) be combined with a statin when needed. Management issues in metabolic syndrome have been recently reviewed (45). In summary, hand in hand with the ongoing epidemic of obesity, the prevalence of obesity-initiated metabolic syndrome—with its increased risk for diabetes, cardiovascular disease, and CKD—has reached alarming proportions. Its impact on renal disease is ensured if only because hypertension and insulin resistance/diabetes are defining components of the syndrome. However, our challenge is to define and ultimately prevent obesity-related renal injury before onset of irreversible damage. Evidence reviewed supports the concept that obesity—via excess body mass and consequently excretory load and/or via sodium retaining forces requiring compensation—co-opts the kidneys to serve those demands, driving nephromegaly and glomerulomegaly, inducing hyperperfusion/hyperfiltration, and creating intraglomerular changes that mimic those of reduced nephron number. In effect, the kidney in obesity has the hemodynamic equivalent of CKD. In addition to the injury susceptibilities that this confers, the systemic signals that mediate metabolic derangement in abdominal obesity are likely to have an impact on renal glomerular and tubular cells: increased FFA, hyperinsulinemia/insulin resistance, reduced adiponectin, and leptin resistance. Identifying functional and structural consequences of these early changes may lead to new renoprotective interventions or dictate earlier initiation of established ones. In the meantime, our growing body of knowledge on optimal renal protection in all stages of CKD seems imminently applicable to even the earliest stages of obesity-initiated metabolic syndrome. Investigative work cited is supported by National Institutes of Health/National Institute of Child Health and Human Development Grants PO1 HD034430 and RO1 HD42570. I gratefully acknowledges the indispensable scientific contributions and administrative leadership of Dr. Kent Thornburg, Professor of Medicine and Physiology/Pharmacology and Director of the OHSU Heart Research Center, in development of the microswine model. You are going to email the following Obesity-Initiated Metabolic Syndrome and the Kidney: A Recipe for Chronic Kidney Disease? Essential Hypertension, Progressive Renal Disease, and Uric Acid: A Pathogenetic Link?